This is the story of HMAS Canberra from from the time the ship was commissioned in 1928 to the last terrifying moments when HMAS Canberra's fate was sealed. Some may know the fate of HMAS Canberra on 9 August 1942 in a war-ravaged Pacific Ocean. World War II was in full force and it was about to overwhelm those on-board the Australian Navy cruiser. But the events that lead to Canberra's demise on that dark night are not so well known - until now. A tribute to the 84 men whose lives were lost, this book tells their stories and those of the men who survived - all share their motivations for joining the Navy and tell what it was like on-board. Kathryn Spurling served with the Australian Navy. After attaining her PhD she taught history and strategic studies at the University of New South Wales at the Australian Defence Force Academy, Canberra. Dr Spurling has lectured extensively overseas and was the first Australian invited to speak at NATO HQ Brussels on the subject of women in the military, and the first Australian Summer Military History Fellow at the United States Military Academy, West Point. 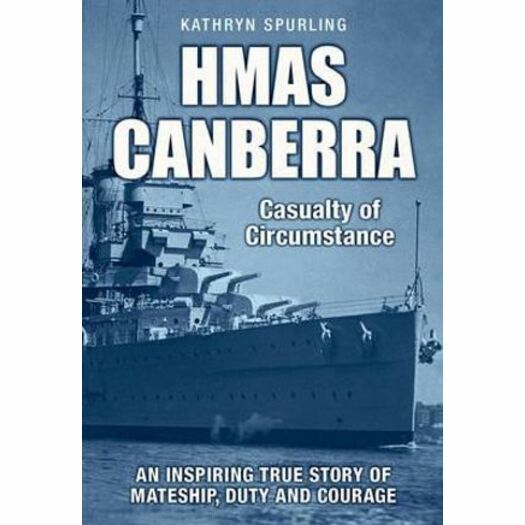 Dr Spurling is the author of Cruel Conflict: the triumph and tragedy of HMAS Perth, published by New Holland in 2008. Dr Spurling is currently a Visiting Scholar, School of History and Social Sciences, Australian National University (ANU) Canberra, Australia.